England is sleep walking towards a potentially catastrophic election outcome, one of where Nicola Sturgeon and Alex Salmond's Scottish Nationalists who with just 4% of the vote would hold the balance of power over 85% of the electorate in England via a weak Milliband minority Labour government, as the final set of opinion polls imply could happen primarily due to votes wasted on UKIP that results in denying the Conservatives some 20-30 additional seats that look set to mostly being lost to Labour. Therefore the only workable majority would be one of a minority Labour government that is supported by the SNP (53) to total 323. Where other nationalists parties such as Plaid Cymru could also tag along at English tax payers expense as the Plaid Cymru leader repeatedly makes clear would happen when demanding from Ed Miliband - "We deserve an additional £1.2 billion in Wales to take is up to parity with Scotland, if you get into government will you give £1.2 billion to Wales?" To go on an £180 billion debt fuelled spending spree on the backs of England's wage slaves, much of which will be funneled into Scotland. Full fiscal autonomy for Scotland but SNP MP's will still be able to vote for tax hikes on English workers. Scottish MP's WILL vote on English ONLY matters. Scrap Trident whilst Russia saber rattles, holding defence spending to ransom if the SNP does not get their way. 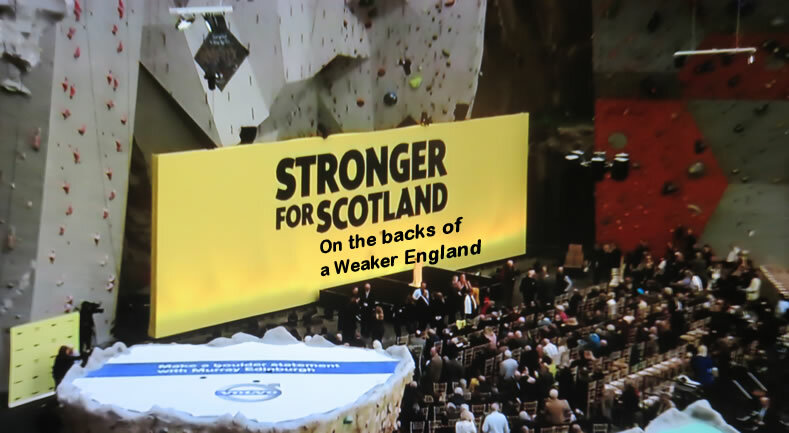 The whole manifesto reeks of the SNP wanting to have their revenge on England for having lost last Septembers independence referendum. Which through extreme interference in English affairs, the SNP effectively seeks to destroy the United Kingdom from within and achieve Independence from within the carcass of a disintegrating bankrupt UK. - Alex Salmond states "If you hold the balance then you hold the power", "it would be very good for Scotland"
- David Cameron announces his resignation even before he has been re-elected. The voters of England should be under no illusion of what awaits them during upto 5 years of a weak minority Labour government supported by the SNP nationalists, where EVERY Bill and Budget will be skewed towards funneling more powers and billions more each year into Scotland as the price paid for a continuation of a weak Ed Milliband government. So whilst Scotland would boom under the weight of the flood of resources, England would suffer as they would bear the social and financial costs of a defacto SNP dictatorship that no one in England would have voted for as effectively 4% of the electorate dictates what happens to the 85% who reside in England. So today the people of England need to fully understand that in this election the Scottish people are voting to put Scotland first without any regards for the well being of the rest o the UK. Therefore it is in the interests of survival that the voters of England ensure to vote to avoid such a catastrophic election outcome, rather than awake Friday morning to find that England is being ruled by those whom no one in England voted for, a Scottish national socialist party whose primary aim remains to become Independant and see's having power in Westminister as a means of funneling as much English wealth into Scotland before the UK breaks apart under the weight of huge social injustice that they will seek to generate as their fanatical extremist zeal has shown through many times during the election campaign despite having orchestrated a carefully choreographed smoke and mirrors election campaign. The peoples of the United Kingdom are literally being sleep walked towards the edge of the cliff, most completely unaware of the potentially disastrous ramifications for not just Scotland but for what lies in store for the remainder of the United Kingdom following a Scottish Independence YES vote that would break start the process for ripping apart a 300 hundred year old entity of an United Island of Great Britain, which as I have repeatedly warned of during 2014 that a YES vote would literally sow the seeds for the balkanisation of Britain as this Island would literally tear it itself apart as the status quo of what had been taken for granted would no longer exist. A whole host of news during the past year illustrate that the approaching Scottish Independence vote has already galvanised agitants right across the UK, for instance blowing on the embers for Cornish independence as they wave their aptly coloured Cornish black funeralesk flag that continues with calls of autonomy literally right at the other end of Britain from the Northern and Western Isles with calls for their own devolution from Edinburgh and even calls for their own parliament that sows the seeds not only for the balkanisation of Britain but also for breakup of an newly Independent Scotland that following a YES vote would soon start to disintegrate, as for instance the bordering regions would reassert their separate identity that has far more in common with the North England than much of Scotland, formerly known as the Kingdom of Northumbria that stretches from Edinburgh in the north all the way to the city of Sheffield in the south. Whilst Alex Salmond, Scotland's Nigel Farage repeatedly plays the Scotland is rich because of North Sea oil card, what he convientely omits is that a significant portion of Scotland's oil reserves lie in the waters of the Northern Isles (Orkney and Shetland). Many people of the Northern Isles see themselves as having far more in common with Norway than Scotland which given the near immediate currency, financial and economic crisis that would follow independence would be fast pulled towards sharing sovereignty for far greater stability with the likes of Norway that could achieve what it could never have done militarily, namely expanding its borders and gaining many western north sea oil fields. Though in all probability the Northern Isles would probably eventually settle as becoming a protectorate of the United Kingdom along the lines of the Isle of Man. So if Alex Salmond 'King of the Scots' does succeed in his tunnel vision mission for an Independant Scotland then he will likely go down in history as the first and last Prime Minister of Scotland as we know it today, which effectively means a Yes vote on 18th September will be Scotland voting to commit suicide as when the dust settles what remains would be a mere fraction of its current size. As my articles of 2014 have illustrated that when states start to disintegrate as the UK would start to do following a vote for Scottish Independence then so would a Pandora's box be opened that would soon see the docile domesticated LIb/Lab/Tory politicians of today's Westminster, the likes of which we have been used to since the end of WW2, replaced by those who would be solely tasked with holding a fragmenting nation together which Putin style would seek to take advantage of economic and political chaos in an Independant Scotland that would not even have a currency, prompted into action to protect the interests of the approx 50% who voted NO to independence resulting in the eventual annexation of parts of Scotland. Post Scottish Independence the Labour Party would be crippled after permanently losing some 41 MP's that would amount to a shift in UK's political spectrum towards the RIGHT that would embolden support for the likes of UKIP which as the name suggests would put the UK first, with the interests of the Scottish people not even factoring into the equation for they would be seen as and be foreigners. Whilst this is beyond most peoples comprehension today, however it would be the natural consequence of a disintegrating state especially as all of the reasons that Putin continuously puts forward for first the annexation of Crimea and lately in support of mostly Russian speaking people of Eastern Ukraine can also be made for many parts of Scotland where more than half the population would find themselves permanently living in a foreign country that they had voted NO to. Not forgetting that the UK has already engaged in several highly dubious if not outright criminal recent wars that required far less justification (Iraq and Afghanistan) and that by domesticated politicians than the justification required for the annexation of several parts of Scotland by more authoritarian, putting the UK first post Independence politicians in West Minister, for Scotland has been a part of the UK for far longer than the likes of the Crimea had been a part of Russia. Therefore an independent Scotland would be economically, politically and socially unstable, and if it followed the example of the last UK state to gain independence, Ireland then it would soon start to split into nationalist and Unionist regions that would seek to rejoin the UK that would be met with Scottish Nationalist resistance sparking violent civil conflict. In fact should an Independant Scotland start to descend into near civil war than the British army could even be invited into regions of Scotland by the local population to restore order, which would as Northern Ireland had before hand spark an escalation in the conflict over where Scotland ends and England begins. 24 Feb 2014 - Scottish Independence Economic Consequences for England, UK, Ukraine 2014, Britain 2016? The real problem of Scottish Independence is as I have highlighted several times in recent articles is that it would open up a pandora's box that would encourage other parts of the UK to start their own separatist movements which would disrupt economic activity right across the UK, and that is the real danger of Scotland leaving the UK, and not its net economic impact on the UK. Ukraine illustrates what tends to happen when countries start to tear themselves apart as peaceful demonstrations in Ukraine's capital city Kiev of barely a few weeks ago have fast descended into chaos towards outright civil war as several regions in the north-west such as Lviv declare independence, whilst the south-east stands behind its democratically elected President who fled the capital with loyal security forces barely 24 hours ago. Ukraine tearing itself apart has huge implications for european stability as the conflict risks sparking unrest in bordering states most of which have their own separatist movements, especially Russia which therefore looks set to intervene militarily. In the first instance the increasingly anarchic border regions would be an ideal breading ground for criminals that would eventually see the gangsters become paramilitaries as they wait in the wings to capitalise upon the many opportunities they will be presented with by the breakup of the UK, as separation will result in a boom time for criminal enterprises such as smuggling, gambling, drugs and extortion protection rackets amongst many others at huge cost to civil society in terms of the day to day lives of ordinary people becoming subject to the whims of flag flying criminal gangs parading their loyalties just as took place in Northern Ireland with echoes still felt every marching season. A situation that the people of the Scotland and the bordering regions of England could never imagine today much as the peoples of Northern Ireland could not imagine what lay in store for them following the breakup of Ireland. Where today, even over 15 years on from the Good Friday peace agreement the people of Northern Ireland still have to contend with the consequences of more than 180 well organised armed gangs, most of whom use the cloak of republicanism and loyalism to engage in a high level of criminal activities that are beyond the experience of the peoples of mainland Britain. To imagine that this would not be replicated in a disintegrating UK and that on a far greater scale is ignoring what has taken place following the breakup of virtually every nation state in history. Weakened states act as magnates for organised crime, just as today Ukrainian, Russian, Polish gangsters are busy capitalizing on the chaos that is taking place in Ukraine. And just as the extinction of law and order in much of Syria and Iraq resulted in criminal gangs even going to the extent of declaring themselves as an Independent Islamic State ! So whilst it is totally unimaginable today for the SNP to have a paramilitary wing, however that does not mean it will be so a decade on from Independence as a consequence of the chaos that would follow the break up of the United Kingdom as we could see Scottish Nationalist paramilitaries battling against Loyalist paramilitaries as they attempt to carve up areas between themselves to profit from criminal activities as a consequence of weakened central states that apart from terrorising the general population will have a huge detrimental effect on legitimate business activities. The bottom line is that on the morning of September the 19th that follows a YES declaration, the peoples of the rest of the UK will wake up to start to realise that the United Kingdom is FINISHED, which will emerge to come as a huge shock to most people who won't fully appreciate the ramifications of such an event until it actually happens. The run up to the referendum is akin to the build up to the the start of World War 1, when virtually everyone thought it would be over within a matter of months where the wide spread perception was one of a fantasy land of boy scout outings at playing at being solider's. They had NO IDEA AT ALL of the HELL that was to come and so it is for the United Kingdom sleep walking off the edge of the cliff. And just as after world war 1 was over most thought how the hell did we allow such madness to happen, and similarly a decade following the aftermath of Scottish Independence, most people will look back at today's UK as representing a golden age of political, social and economic stability that they would crave for the return to, but in reality would take many generations to repair the damage done. In terms of investment decisions, if Scotland votes Yes, then it should be taken as a cue to start to disinvest from the UK, and to seek to formulate an escape plan from the UK before the penny drops and what is completely unimaginable today starts to become manifest, much as many Ukrainians barely a few months ago (February) could not conceive of how bad the situation in their country would become barely 6 months later as the break up of their country continues to unfold as the level of conflict continues to accelerate towards a state of all out war, a situation that was totally unimaginable at the start of this year! The bottom line is that Britain is on the path towards ever more ferocious nationalism, whilst it has started with Scottish nationalism but it won't end there! and the end won't be pretty! Therefore the voters of the UK need to recognise this trend trajectory and ensure that nationalism has no part in power for it will have highly destructive consequences. Whilst Scotland is already well along that path as we saw the emergence of Nationalist storm troopers repeatedly shouting down any opposing opinion during the election campaign.